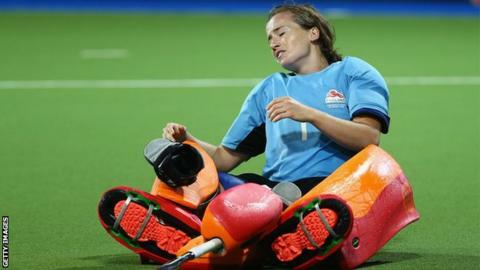 England's winless run continued as they lost 3-1 to New Zealand in the Champions Trophy quarter-finals. Rose Keddell gave Pool A winners New Zealand the lead in Argentina, as she deflected in from a penalty corner. Laura Unsworth levelled but Anita Punt restored New Zealand's lead before half-time and Stacey Michelsen ended any hope of an England comeback. They face Japan in the first of two fifth to eighth place classification matches on Saturday in Mendoza. England head coach Danny Kerry said: "It was a bright opening spell for us across the first seven minutes or so and we had some good chances, however we rapidly went off our game after that. "Three of our squad are suffering with heat stroke following the match and I think it was clear how tough it was out there today." England have yet to win a match in the tournament. They drew with Germany and lost to Australia and hosts Argentina to finish bottom of their pool, resulting in a low seeding for the knockout stages. New Zealand will play Australia in the semi-finals.